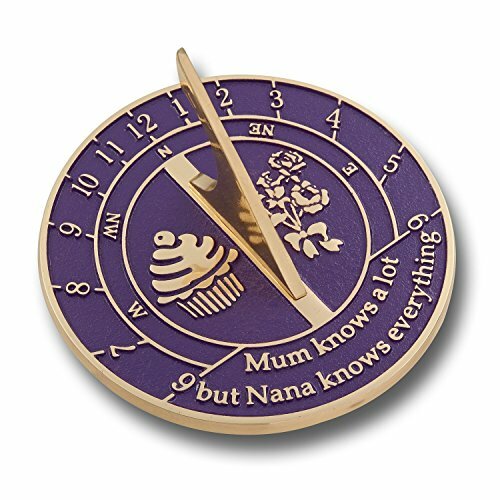 With a Nana's Sundial Gift she will be showing YOU how it works! So you don't have to book more time off work to show her how to use that new gadget for the 6th time that week! A gift is not a pair of pants, it's not an itunes gift card, a box of chocolates or even a sundial! It is just a symbol of love from one human being to another. It is you saying to your Nana "I love you, I am thankful and thinking of you and I want you to know that every time you look at this gift." That's all it really is! So if so then get her something that will last! (Probably longer than she will) And she can appreciate every time she sees the finely hand polished finish that she can probably do her lippy in. Each sundial is handmade from thick brass and is fully lacquered. There is no need for you to re-polish it ever again. It's dimensions: diameter 165mm (6¼") and height with gnomon 75mm (3"). This is an awesome quality handmade item you cannot buy in the shops. Made from solid cast brass, it probably weighs more than her Christmas dinner! FULLY PROTECTED FROM THE ELEMENTS: With solid metal, outdoor quality paint and a 2 coat heavy duty lacquer this sundial can endure wind, rain, frost, occasional British sunshine and even red wine for if Nana launches her wine glass across the room during an enthusiastic game of Charades.